Many homeschooling parents tend to get nervous or frustrated over the thought of their child not being able to get into college. Well, fear no more. Homeschoolers are seeing more and more opportunities for post-secondary education after graduation. 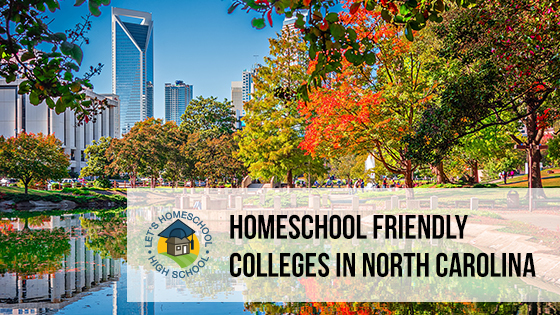 If you’re looking for North Carolina colleges that accept homeschoolers, this is a good place to start. We’ve listed the top college requirements for homeschoolers so you can get an idea of what you’ll need to do if you’re interested in that particular school. Duke University offers a unique college experience for those who are looking to attend an ivy league school. With the rigorous academics, engaging community, and athletics offered, this University is one a kind. Duke is known for their schools of Business, Law, Science and more but push students to find their own educational path. Duke welcomes students who are educated in unconventional ways such as homeschooling. They truly believe student brings uniqueness and diversity to the community, fortunately enhancing it. Regardless of the students’ educational background, all applicants are evaluated in six areas: standardized testing, curriculum choice, achievement, recommendations, essays, and extracurricular activity. If your student is interested in studying social sciences, biological and biomedical sciences, communication, or journalism, UNC might be of interest. The University of North Carolina welcomes students from all backgrounds and ways of learning, including students schooled at home. They impose no special or extra requirements for their home-schooled applicants. It is important for home-schooled students to know that their credentials may lack some or most of the information typically found in the transcripts, grades and academic programs of students schooled in traditional outlets. For that reason, they recommend that homeschooled students do their best to help them see their academic performance in the best light. With a 96% employment placement rate, High Point University strives to see their students inside and outside the classroom, and so far has proved true. With over 50+ majors to choose from, High Point offers the Project Discovery program that is designed to help students find their perfect major. At High Point University, they understand the value of education, especially those who were homeschooled. Their experience has shown homeschooled students to be well-rounded individuals with a solid foundation and a mind for learning. Homeschooled applicants should take the opportunity to boast their extracurricular activities on their transcript and within their application. The University of North Carolina has many majors to choose from under the divisions of Humanities, Natural Sciences, and Social Science. The Admissions Committee reviews each candidate’s application individually, considering all aspects of the applicant’s record before making a decision. The committee places a strong emphasis on the quality of the candidate’s high school curriculum, performance, trends, and class rank (if provided), and performance on standardized tests in the final decision-making review. The comprehensive review of all applicants is designed to see if applicants are the best fit for UNC Asheville and vice versa. Montreat College is an independent, Christ-centered, liberal arts institution that educates students through intellectual inquiry, spiritual formation, and preparation for calling and career. Offer majors such as American Studies, Business Administration, Outdoor Ministry, and many others, there is no doubt that your students won’t find their passion here. They welcome students from other forms of schooling, including nontraditional outlets like homeschooling. Belmont Abbey College has welcomed a large number homeschoolers each year, in fact, many students have been homeschooled for at least one year! The Benedictine hospitality starts with their Monastic Presence, but it extends out to the student body. Belmont Abbey College offers many of the most popular majors. They have a small, but close family feeling community that makes it easy to adapt. So, if you’re looking for a smaller college experience, Belmont Abbey College can be your home away from home! Davidson College seeks out intellectually curious students who are committed to developing their talents for lives of leadership and service. With an average undergrad enrollment of 2,000, their small classes allow their faculty to work closely with students and allowing a space for creative work across the arts, sciences, social sciences, and humanities. In the classroom and beyond, Davidson cultivates students’ compassion, creativity, resilience, and moral courage. Forsyth Tech is committed to its students bringing them an environment of excellence, learning, responsiveness, diversity, and respect. They help their students to enter the local and global economy prepared, regardless of their schooling background. They offer a variety of schooling options for future students of theirs. You can get a college transfer degree, career focused-degree, diploma, train for a new job or gain skills to help you advance or take personal enrichment classes. Requirement 1: North Carolina home school administrator must show and provide proof that the home school is certified by the North Carolina Division of Non-Public Education. Homeschool students are welcome at Spartanburg Methodist College. With our small class sizes, supportive environment and personal attention from professors, we’re an excellent option for students who want a comfortable transition to college. SMC offers both 2-year and 4-year degree paths. Their four-year degree path is geared towards students who want to pursue concentrations in Business, English, History, and Religion. College of Charleston is a public sea-grant and space-grant university located in Charleston, South Carolina. This means that the university is highly involved in scientific research, education, and training when it comes to marine areas as well as outer space. CofC happily welcomes applications from homeschooled students. The same requirements apply to a homeschooled student as to a traditional high school student. Western Carolina University, founded in 1889, is the fifth oldest institution in the UNC system. They believe that choosing a university is more than just a beautiful location or a degree program, it’s about finding a supportive community that recognizes your potential and a program that will help you achieve your future. Students who have been homeschooled are a perfect fit at WCU with a welcoming environment and diverse student population. Lees McRae College offers over 30+ majors students can choose from including religious studies, special education, nursing, biology, and English to name a few. Lees McRae fosters a learning experience through hands-on exploration, internships, and opportunities to reinforce what you find in books. Firsthand understanding can be more valuable and rewarding than reading material. Their programs teach you how to navigate the path ahead and help you sculpt your future.